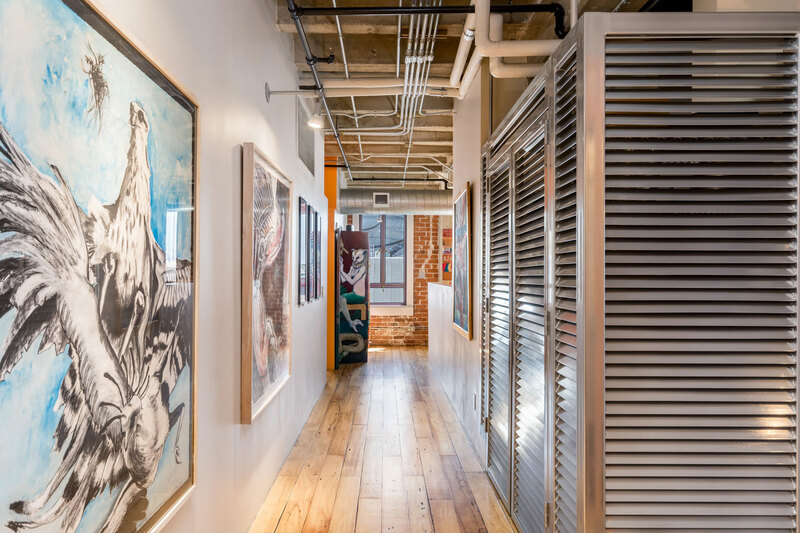 Downtown Living: Bright Colors, Artwork Warm Up This Eclectic Orpheum Lofts Home - Downtown Phoenix Inc. When Bill and Belinda Miceli moved to Phoenix in 2008 and began looking for a place to rent, their local friends and family warned them to steer clear of downtown. Of course, they didn’t listen. Over the last 20 years, they witnessed the resurgence of urban centers in other cities they’d lived in like Chicago and Denver, and believed there was potential here. Plus, they fell in love with the community. In 2011, downtown home prices plummeted to rock bottom, and the Micelis knew the time was right to buy. “If you’ve ever lived in the suburbs, you’re tired of the drive, you’re tired of the cars, tired of the garage — it’s very isolating and it’s really boring too,” said Bill Miceli. 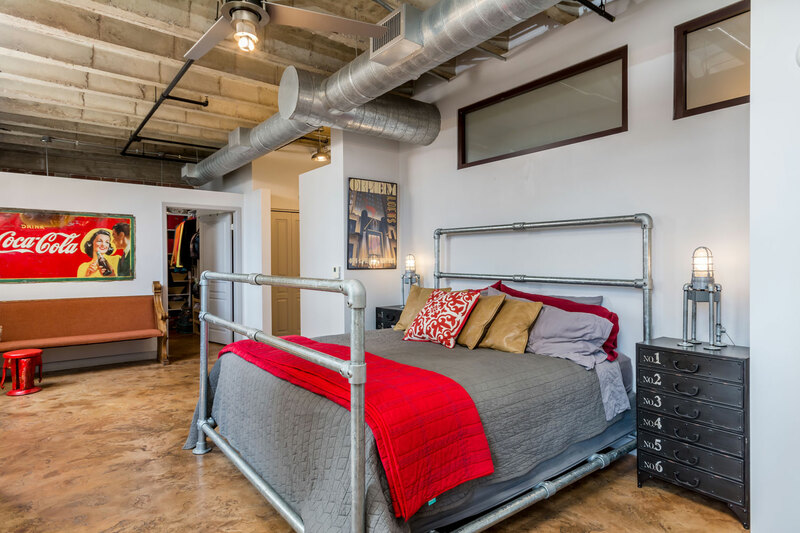 They purchased two side-by-side units at Orpheum Lofts, which were converted into a single, 2,300-square-foot home by the previous owner. 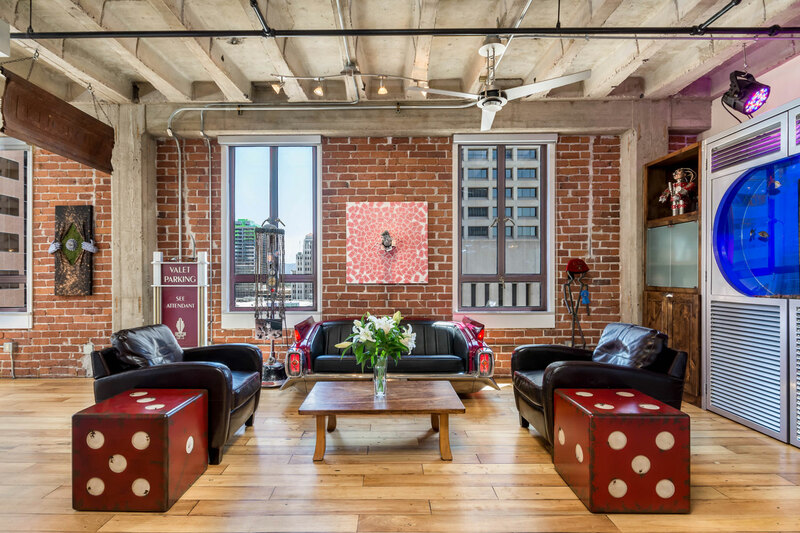 Built in 1931 and redeveloped into residences in 2005, Orpheum Lofts is an 11-story Art Deco-style high-rise with exposed brick and ductwork, open floor plans, an indoor pool, doorman, and gorgeous marble and terrazzo-clad lobby. Very little work needed to be done to the loft itself, besides warming up the cement countertops with a bright red epoxy and sanding down the dark walnut floors to give it a more rustic feel. 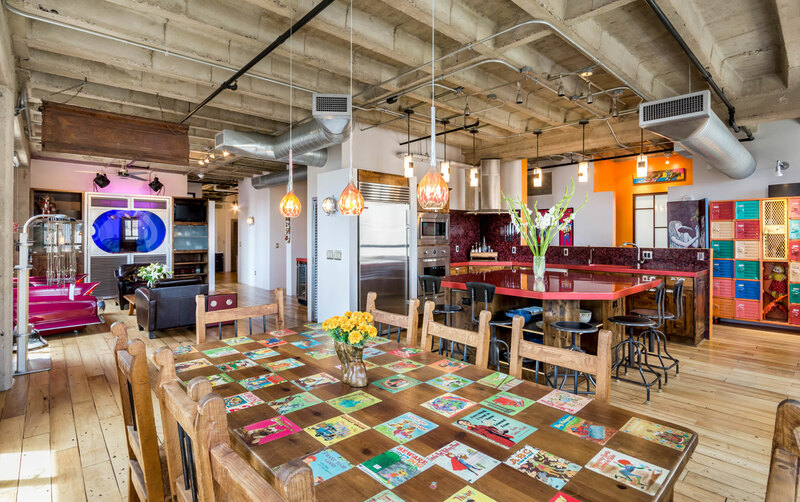 The biggest transformation came in the form of the Micelis’ interior design aesthetic, which has been “a real progression,” according to the couple. Over the years, they picked up an eclectic mix of furniture and artwork on travels — like African masks and Caribbean paintings — and pieces in the many cities they’ve lived, such as an old church pew from Chicago and a Southwest-style table from Taos. The Micelis certainly don’t shy away from bright colors and artwork of every form, which fills the home. And surprisingly, most of it was done by family members. The large-scale bird paintings lining the entryway are by Belinda’s mother and the photography was done by her father. A couple of mixed-media pieces, which are covered in playing cards, can be attributed to their youngest son — an amateur magician. With a combination of artwork, antiques and collectables from across the world, something interesting and beautiful stands out in every room, and it most likely has a story to go along with it. Antiques like a 1940s Coca-Cola sign and a hair-permer-turned-floor-lamp from the 1920s create accent pieces that pop. Next to the kitchen, you’ll find a bank of lockers salvaged from a Phoenix school. And the dining room table? Belinda decoupaged Little Golden Book covers to the top, a throwback to when their kids were little. Then there’s the couch — custom-made out of a real 1962 Cadillac in honor of the year Bill was born. 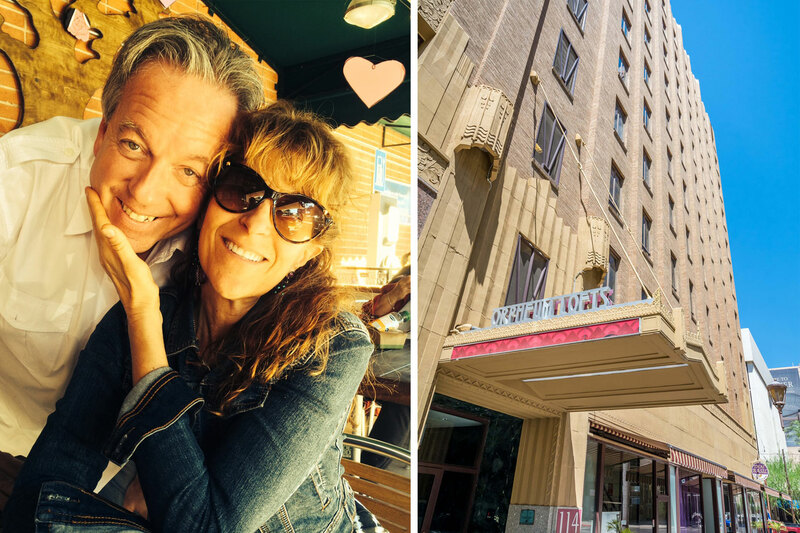 Now in their mid-50s with grown children, the Micelis found a close-knit community of baby boomers and empty nesters in downtown that are just as adventurous as they are. Their grandkids love to come over and take advantage of all the family-friendly activities downtown has to offer. From the Arizona Science Center and Diamondbacks games to events like Zombie Walk, the Micelis do it all. Neither are fully retired just yet, and they show no signs of slowing down. 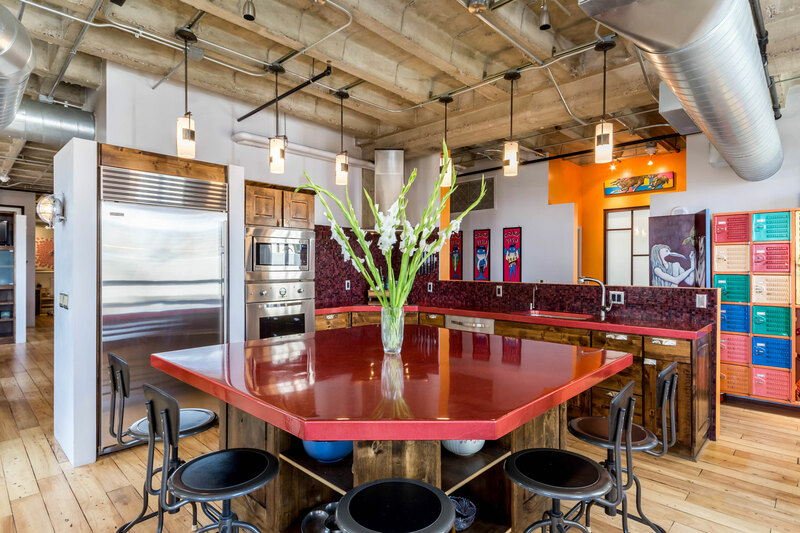 The Micelis plan to travel off-and-on for the next year and put their beautiful loft on the market. The goal is to design something even funkier than than their current home, according to Bill. They toyed with the idea of building a residence out of defunct shipping containers on an empty lot or converting an old warehouse. What their next home will look like is anybody’s guess. But one thing is certain and non-negotiable for the Micelis: it will be somewhere in Downtown Phoenix.